Hello everyone, Dad Terry here with some sad news. Earlier today our sweet Sister Gracie posted her letter to her beloved Husband Alex. Gracie decided that today was the day she must depart this world to be with her Angel Alex and our Angels Sascha, Kit, Ivan, Moses and Beth. She asked me to help her and I just had to say yes. As most of you know, Gracie had really bad asthma, and it was getting progressively worse to the point where it was a struggle for her to breath. The poor sweetie could only walk a few steps and would have to rest. Her labored breathing was difficult to watch. The asthma coupled with her obesity from all of the medicines finally got the best of her. Gracie, thank you for loving us all so much and for allowing us to be your forever family. We will all cherish the many happy memories and we’ll all miss you and love you forever. You were special, unique and made us smile more times than we could ever count. I’ll see you at the Bridge someday sweetheart. 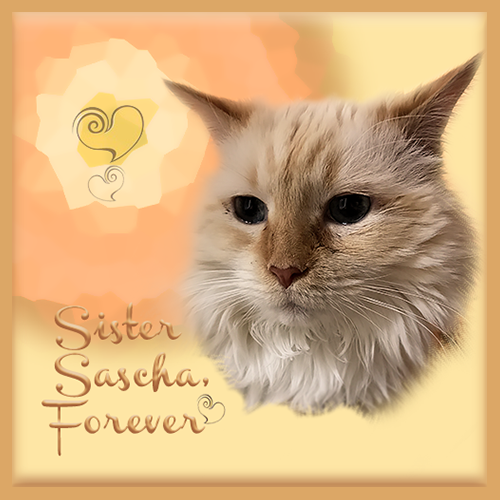 Thank you to Ann from Zoolatry for the beautiful memorial graphic. p.s. We’ll be taking tomorrow and Wednesday off and will see you all on Thursday. Oh no! I’m so sorry about Gracie. I know how hard you worked to keep her asthma in check. Lots of purrs to you and your family. Oh dear. I am so sorry to hear this. It is never easy to let our beloved cats go even when they are ready. Sending lots of hugs of comfort in your loss. We will never forget Gracie. We are so sorry about your sweet Gracie. Sending purrs for you all. Oh no, that is so sad about Gracie. We are so so sorry. Just keep in mind she was such a lucky cat to have lived with you all and had so much love and it was so kind of you to let her go. We send many hugs and good thoughts. 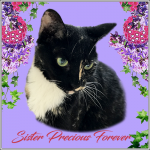 Gracie…dear Angel you were loved to bits here on earth and were such a brave and graceful lady cat. Fly free with lungs full of fresh air. We are so very, very sorry for your loss. When we read the earlier blog post, we had a feeling that Gracie was telling us goodbye. We can imagine the sadness you all feel, and that we share with you. Run Free, Sweet Gracie. Enjoy being with Alex again, and all those who have gone before. We shall meet again. Our hearts are broken for all of you as we know how dear Sister Gracie was to all of you. It is so sad that the humans all too often have to make the difficult decision to do what is so hard for them but what is best for our beloved furries. Our hearts go out to all of you. Soft woos and gentle hugs from all of us. Oh no! Our hearts are breaking. We’re so very sorry to hear this news about Gracie. Sending you all comforting purrs. We are so furry sad here. 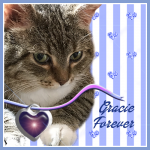 We knew Gracie was not in the best of health and included her in our purrayers. We send you guys our love and strength. So so very saddened to hear that Gracie has left us for that journey over the bridge. Your care and devotion to her and her condition were exemplary, and I know if it was time then it was so. May your heart rest easy knowing that she will be too…. Dad Terry and family, we are so very sorry to hear about Gracie’s passing. She was a beautiful girl, and we know she was loved very much. Please know we are thinking of you all and sending lots of purrs, prayers, and love your way. Just cannot believe this! Angel Gracie, you are free from your earthly body now, and can fly with the other angels in Heaven. Sending you hugs and purrs up there, and some more to Earth where your humans and other cat friends now grieve without you. Oh Brian and Terry, I am so very sorry for your loss. It is heartbreaking. Gracie was a real sweetheart and well-loved in the Cat Blogosphere and everywhere. At least she is finally with her Alex, and you gave her the best life a cat could have while here on Earth. I’m sure she’ll be reunited with her fur family on the Rainbow Bridge, and maybe she’ll even run into Dante, Domino and Dylan. You have my sympathies. It’s the most difficult time one can go through. My thoughts are with you all. Oh Terry I am sat here in tears at your loss of such a sweet girl. Fly free Gracie, go meet Alex. Dash will also greet you and say hello. He says it’s one of his jobs to make friends welcome. Your family fought your corner long and hard but listened when the time game. Our condolences on your grievous loss. Oh no, I just saw this after reading the other post!! We are so very, very, sorry for your loss. You know Gracie had a special place in our hearts because she reminded me so much of our own Miss Bones, who has been gone quite some time now. Our hearts are with you at this sad, sad time. You gave Gracie the best life she could ever have hoped for. ♥ RIP, sweetie, we will miss seeing your sweet face so much. I am so sorry to hear about Sister Gracie. I know there is a huge hole in your heart right now. Please know my thoughts and prayers are with your family and you. I am so very sorry for your loss. I know Gracie was a special girl and will forever be close to your hearts. This has been such a tough year for your fur family as 2017 was for us. Hugs to all of you. So sorry to hear about Gracie. Purring for you all. Poor Gracie. Sure had a wonderful place with you all though. Purrs sent. My thoughts and prayers are with you all. You now have another beautiful angel watching over you. Oh no…I’m so very sorry. My heart is heavy for you. Gracie was a sweetheart and her paw prints will live in all of your hearts forever. Wishing you comfort. I’m so sorry for your loss. Sister Gracie is filling her lungs with the sweet flowery air at the Bridge and bumping heads with all her friends. Sister Gracie had a good life with you, and you will always have many happy memories. We hope that those memories help give you some comfort now. We’re so very sorry. Run free, beautiful Gracie with no more health problems. I am so, so sorrt for your loss. It is so hard to help a loved one to the Bridge. I’ll pray for the family. We are sorry to hear about Gracie. Fly free sweetie! I’ve come back to pay my respects to Gracie. *bows head* We all have leaky eyes so you’ll have to forgive typos. Comforting purrz to you and those she leaves behind. You know that Gracie was my absolute fave after you, Brian. I’m so very sorry. It’s so hard to let them go, but they do tell you when it’s time. I am so very sorry to hear about Gracie. Sending comforting thoughts to all of you. We are so incredibly sorry for the loss of your beautiful sweet Gracie. Comforting purrs and hugs for all of you. We are so very sorry that it was time for Gracie to cross over. Many hugs and purrs and purrayers from all of us at Forty Paws. Oh what a sad day. So sorry you lost a loved one, but you gained another angel. Our purrs and love to everyone. We are so very sorry to hear this. Thank you for giving this sweet kitty a happy life and so much love. Love and comfort to all of you. I’m so, so sorry for the loss of sweet Gracie. Sending gentle purrs of comfort and love your way. Oh I am so brokenhearted . Gracie. I am so so sorry. God speed dearest little one. Rest in peace precious little girl and know we all love you and miss you. We will always remember you. I am in tears. Oh, Terry, we’re so sorry to read this sad news. No one could have done more for her, tried more for her, than you did through the years. Our thoughts and purrayers are with you all; sending Light and hugs. Our hearts ache for all of you! We know Gracie’s departure cuts to the heart, although you know she is not suffering with breathing problems any more. Warm hugs from all of us to all of you! So very sorry Gracie had to leave for Alex and the Bridge. My heart is with you all. I send you strength to deal with her parting. Heart is breaking for you. Godspeed Gracie – you are so loved. ohhh! we are so saddened to hear this! we are very sorry for your loss and send our biggest purrs to you all. rest in peace dear Gracie. NOOOOOOOOOOOOO….oh Brian an Mistur Terry an Lady Celeste you know LadyMum told mee Gracie was leevin soon….an now Gracie iss gone to Pure Land. Mee iss so berry sad fur yur loss…..Pleeze accept mee an LadyMum’ss sympaffiess. Take all thee time youss’ need. Wee bee here fur youss’ when you ree-tern. We are so sorry about Gracie. Her letter today was so sad. I’m so sorry for your loss of sweet Gracie. You worked tirelessly to manage her health issues and give her the best quality of life, and she was fortunate to have you help her have a peaceful passing. She will always be a part of you. Purrs. We’re very sorry to hear the sad news about Sister Gracie. Our thoughts are with you. Sending comforting hugs and purrs. So sorry to hear the news! She was so beloved. I will miss those eyes. Our thoughts are with you! I’m so sorry for your loss. It is so hard to lose a fur friend. This is such sad news. I knew Gracie had asthma and that she had some really rough times in the past. I honestly did not realize how bad it had gotten. I’m so sorry. I wish there was something comforting I could say. I know that you’ll miss her a lot. I’ll miss her as well. We were truly sad to read that Gracie had to say good-bye. We know she was one of the lucky ones because she was loved by you as all living beings deserve to be loved. You did well by her. Gracie , we know all you furblings will be waiting for you as will Mitalee and Esme. Rest in peace sweet girl. We will miss you. Sending our love and hugs to you. Dear Gracie, we are so sorry you had to leave your family and know that your family’s hearts are breaking. Our sweet Sunny left for the Bridge this weekend and we know she would make a great friend for you there. We very much appreciate the words of comfort we received from your Dad over Sunny’s passing and wish your family to know our hearts are with them. I’m so very sorry for your loss. Sweet Grace will be missed. Hugs and purrs from all of us to all of you. Oh my…….sometimes there just are no words……but indeed Sister Gracie did grace your world and ours with her sweetness. 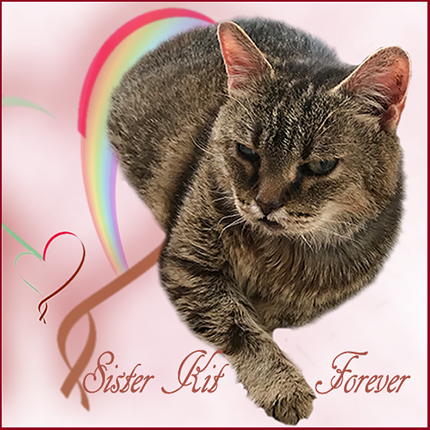 It warms our hearts knowing that she is no longer suffering and that she’s with her beloved Alex at the beautiful Rainbow Bridge. One day you will all be together but now you have just one more Angel to watch over you. We send you lots of hugs…..and our love. So sad to hear about Gracie… But you did the right thing to let her go. Oh my, we are so sad for you. So many of you lovely felines have passed. Hugs to your family from all of us. I guess we knew about the asthma but not how bad it really was. Rest in peace. I’m so sorry to hear this. I’m sending lots of love to you, the kitty family and to sweet Gracie. We are so sorry to hear you have lost your sweet girl, Sister Gracie. Love and comforting purrs to you and your family. We were so very sorry to see this late yesterday. Our thoughts to you as you all mourn Gracie. I’m heart broken learning precious Gracie has taken the road to The Bridge. We send you all our warmest hugs and softest paw pats. Oh no… I am so sorry. Sending love and hugs to every one of you. May sweet Gracie rest in peace. We are sad to hear Gracie has left you to be with her beloved Alex. Hugs and purrs from our house to yours. Oh Uncle Terry, we’re just beside ourselves. We know bootyful Gracie was yours, but we just luv you all so much we feel like a pawrt of us is gone too. We are so very sorry fur your loss. We know that Gracie will live on in all our hearts. Fank you fur givin’ her the bestest life pawssible and lettn’ us share her life. We’re sendin’ lots of hugs and purrayers to all. How devastating. Life is unfair and it sounds like Gracie knew that better than most. At least she had your never-ending love and knew she wasn’t alone. I am so so sorry for you loss. Sweet Gracie Rest in Peace and be with your Alex!!!! Farewell sweet Gracie. Comforting purrs to your beans. Dear Terry and your entire family, please accept our condolences at this time of profound loss. Gracie was one of the first blogging cats we had the privilege of enjoying over the past seven years. Her beauty and expressive antics will be sorely missed. She was a champ dealing with asthma and instead of the usual “fly free” may Gracie also be breathing free and easy in the great beyond. xo and purrs of comfort. Layla and kitties. Our prayers to all of Gracie’s family. I am very sorry to read of Gracie’s passing. It must have been heart-rending to watch her struggle. Knowing that you were setting her free surely didn’t make the decision easier. It never does. Please accept my condolences. Godspeed, Gracie. I am so sorry to hear that. You have my sympathies. I am so sorry for your loss of dear Gracie. I am on holiday and with very patchy internet haven’t been online for 2 weeks, so I was shocked to see your sad news. I send my love and condolences to all of you. I am so sorry to see that Sister Gracie has gone to the RBB. Lots of purrs, prayers, love and hugs we send to you. Mags, Chancy and Pooh. Dear Dad Terry, Brian and the gang…. Sneakers , Friday and I are said to hear this news and we send along lots of purrs and purrayers. Daddy Kiril says he believes our beloved Nikita was among the welcoming committee at the Bridge upon her arrival. our hearts and love are with you. codspeed Miss Gracie! 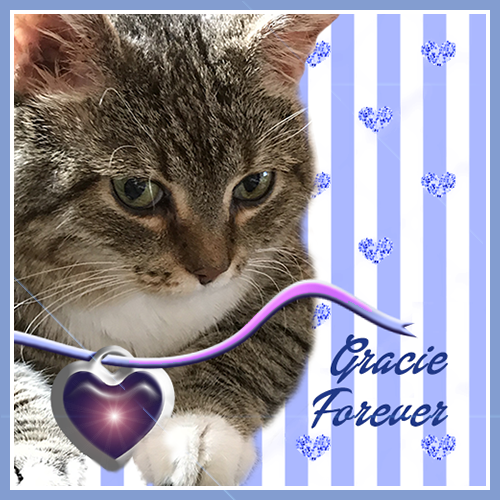 Sweet Gracie – no one could have loved you more than your humans and your blog family. We are so blessed to have known you and we know you are forever happy with Alex now! Sending many comforting purrs to the humans who miss you so…. Oh, Terry, I’m so very sorry. I know how precious Gracie was and she will forever be a beautiful part of your heart. My love and purrs to you and your family – Deb and the Zee/Zoey gang.